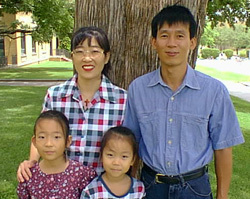 Myung-Gyu Song, from the Department of Regional Planning at Dankook University in Seoul, Korea spent the1996-1997 academic year as a visiting research professor at the universtiy. He brought his wife and children with him and took them to see much of the western United States. 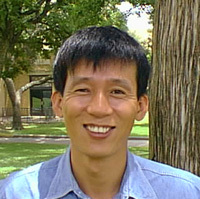 Hsiao-Peng Hua graduated from the Universtiy of Texas, Austin with a Ph.D. in environmental education in spring 1996. He then spent 1996-1997 at the Center for Environmenal Philosophy engaged in postdocrotal research in environmental ethics. Hua collaborated with Maggie McRaven, a graduate student in the environmental ethics program, and presented a paper on "A Taoist Perspective on Environmental Education" at the 26th Conference of the North American Association for Environmental Education in Vancouver, British Columbia in August 1997. Ricardo Rozzi, a graduate student on a Fulbright Fellowship from Chile, is working toward a Ph.D. in ecology at the University of Connecticut. He is taking courses in environmental ethics during the summer and fall 1997, which will be part of his coursework toward his degree in ecology. Ricardo is attempting to bridge the gap between ecology and philosophy as part of his work for initiatives of the Institute of Ecological Research of Chiloe to explore the role of ecological values in the relationships between communities and the native forests of southern Chile at both the local and national level. 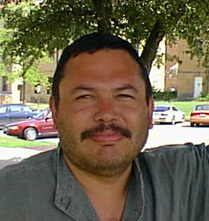 Jorge Mario Rodriguez Martinez, a Fulbright Fellow from the University of Saint Carlos of Guatemala, is spending the summer of 1997 attending an environmental ethics seminar and translating environmental ethics materials into Spanish for publication in Guatemala. In fall 1997 he will study philosophy at Ohio University, Athens. 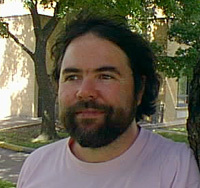 Kurt Jax of the Center for Ethics in the Sciences and the Humanities at the University of Tuebingen spent two weeks in fall 1998 in the department as part of a research trip to the United States, investigating the impact of various definitions of the ecosystem concept on management policy.